Rollin’ On TV, the popular syndicated TV series that explores the RV lifestyle, has released a real-world review of the Vintage Cruiser conducted by noted RV expert, Jeff Johnston. Jeff and his wife size up RV’s the way RV owners do – By taking them on the road, putting them through their paces, and camping in them! In his review of the Vintage Cruiser, Jeff raves about the trailer’s on-road handling and maneuvering, noting that its modest overall length, good weight balance, aerodynamic shape, and light weight make the Vintage Cruiser a cinch to tow, park, and back up. Jeff points out that the size also means the Vintage Cruiser can access smaller campsites that often offer the best views and most attractive surroundings. 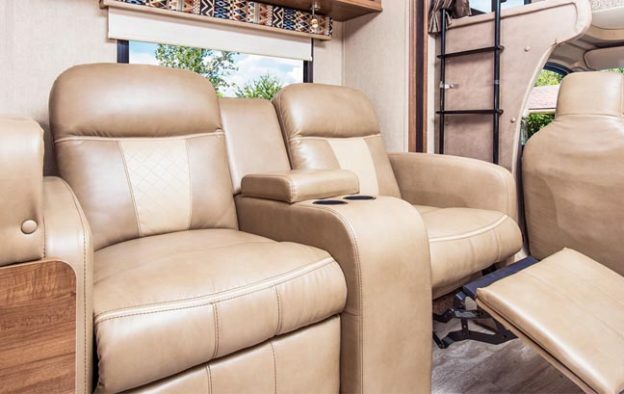 Inside, Jeff makes it clear that the Vintage Cruiser does a great job of combining the appeal of the ‘retro’ look with the convenience of technically advanced features and construction methods, including the use of laminated walls and Azdel substrate. He tours the living space, noting that his 6-foot-3 frame fits easily and feels comfortable inside the Vintage, with its 83″ high ceilings. Why not get the whole story direct from Jeff by clicking the link below and watching the 6-minute video. You’ll hear how much an RV expert and enthusiast like Jeff loves the Vintage Cruiser! 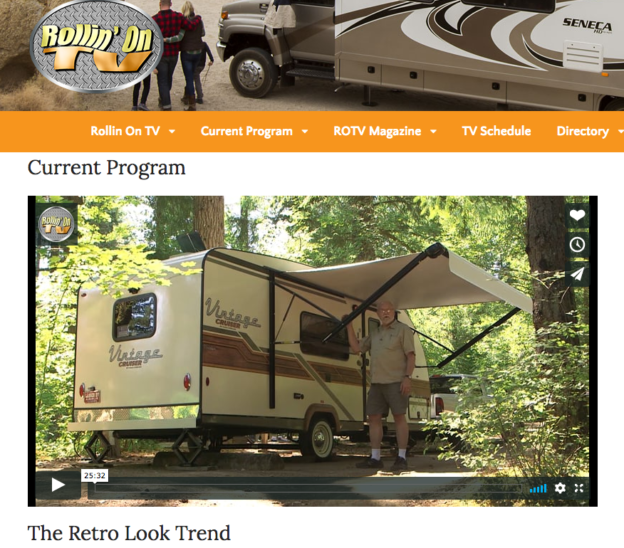 A note about Rollin’ On TV: This multi-faceted 1/2 hour program covers a wide range of RV topics, from construction, to product reviews, to campsite cooking, and destinations. It is offered to over 40,000,000 households through cable and satellite systems throughout the US and Canada. Rollin’ On TV also posts all current and past episodes on their site, at www.rollinontv.com. Need more Vintage Cruiser information? Visit the Vintage Cruiser online here. Curious about the cost of a new Vintage Cruiser? Try this link for a no-cost, no-obligation price. This entry was posted in News on October 11, 2017 by pcampbell@gulfstreamcoach.com.